The TI-5006 is a typical low-cost printing calculator using normal paper. A similar calculator was introduced one year earlier with the TI-5005 IIB. The internal construction of the TI-5006 reveals no surprises, a clean and simple construction based on a single-chip microcomputer. The TI-5006 kept the overall design and the keyboard layout of the former TI-5005 IIB. Two years later the TI-5006 II added the always missed [+/-] key. 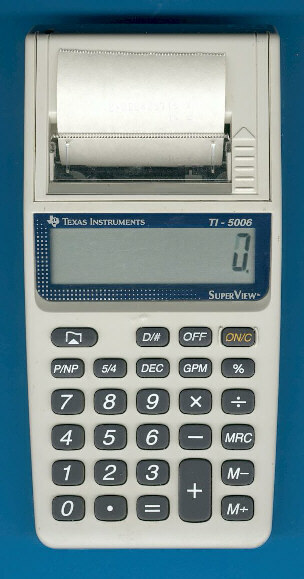 The TI-5006 is featured in the Texas Instruments Incorporated sales catalog CL-1233 dated 1994. © Joerg Woerner, October 23, 2003. No reprints without written permission.